President Trump has been pushing back on the notion of a "blue wave," and embracing the idea of a "red wave." But the adaptation of "red" is a popular culture shift from the Cold War. 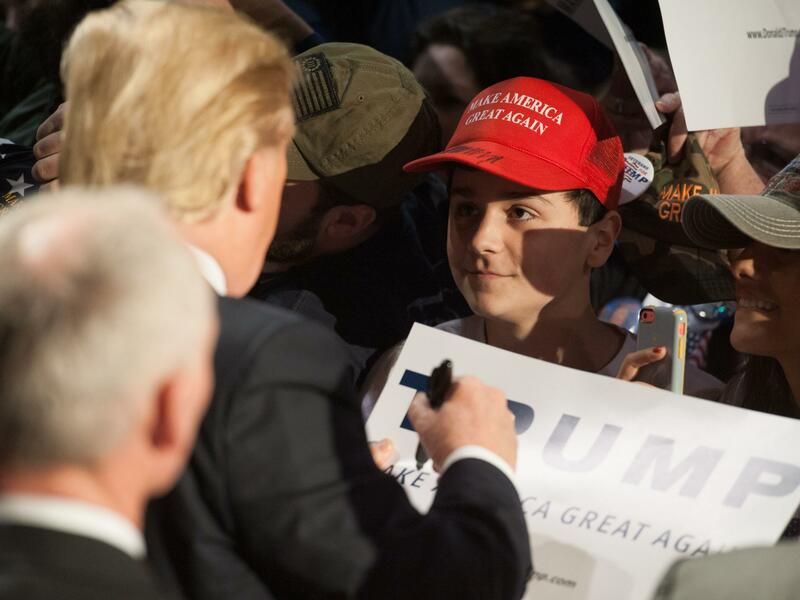 Donald Trump signs an autograph for a young man wearing a Make America Great Again hat during a rally in Millington, Tenn. If you're a Republican or a conservative from the old school, it's a little hard to relate to President Trump shouting, "Red Wave!" at his rallies, or tweeting it out in all caps, as he has done this week. Literally, he tweeted just those two words in all caps. It should be lost on no one that the president is countering the talk he hears about a "Blue Wave," which is media shorthand for Democrats' promising prospects in the coming November elections. 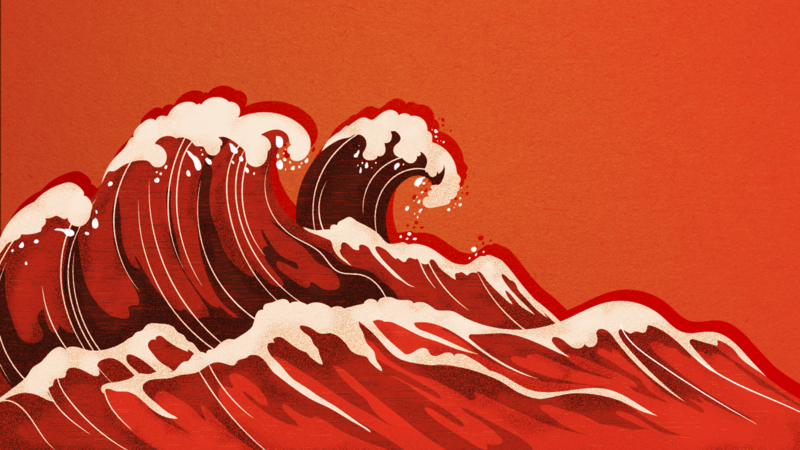 But somehow the phrase "red wave" does not quite feel comfortable. It's probably better than "red tide," which connotes the kind of toxic algae bloom that is now devastating some beaches in southwest Florida. But there's a larger problem. Not so long ago, red was universally the color of communism. The Soviet army in Russia was called the Red Army. China was routinely referred to as "Red China" in the U.S. for decades after the communist takeover there in 1948. Fear of communist infiltration led to "Red Scares" after both world wars, and generations of American youth were taught in school about the "Red Menace." People regarded as having even mildly socialist sympathies were referred to as "pinko." In the 1980s, popular movies about communists or Soviets or Russians had the telltale color in their titles (Red Dawn, Red October and just plain Reds). Much of this usage fell away with the fall of the Berlin Wall in 1989, which signaled the end of the Cold War and the rise of a post-Soviet era in Russia. But the sense of the color red being leftish never entirely left the culture. London's mayor a decade ago was a socialist named Ken Livingstone who was often called "RedKen," and Jennifer Lawrence's latest release is a Soviet-era spy pic called Red Sparrow. So how did the political meaning of the color red in our country get ... confused? Well, it didn't start with Donald Trump. But it did have a lot to do with television. NBC was the first all-color network, and on Election Night 1976, NBC's John Chancellor had an illuminated map that turned states blue when they were called for the Republican candidate, incumbent President Gerald R. Ford, and red if they went for the Democratic nominee, Jimmy Carter. That's not a typo. The GOP was blue, the Democrats were red. And the same color scheme prevailed four years later when the Republican nominee was Ronald Reagan, who turned most of the map blue before the West Coast got home for supper. That is, the TV map turned blue if you were watching NBC or CBS. If you were watching ABC, Reagan's landslide was blood red. So if you were a channel flipper, it was a real head spinner. Graphic artists at the networks experimented — orange, yellow, green — but let's face it, Election Night maps in our country need to be red, white and blue. Blue made sense as the Republican color. It is typically associated with the more conservative parties in Europe (and elsewhere) and had been used in this country in textbook and reference maps to indicate states voting Republican. Blue was, of course, the Union hue in the Civil War, the struggle that gave rise to the GOP (which stands for Grand Old Party, a reference to the Grand Army of the Potomac). Not surprisingly, many Democrats disliked the communist implications of being the red party and objected to being so designated for millions of TV viewers and voters. And besides, the historic expectation of Northern states voting Republican and Southern states Democratic was no longer operative by the late 1900s. In any event, the confusion between the networks' Election Night color choices persisted until the fateful year 2000, when all three broadcast TV networks and CNN finally settled on a common color scheme. Democrats were blue on all channels, Republicans red. No one seemed to think that meant that the party of Reagan had gone soft on communism. Of course, the outcome of the 2000 election remained in dispute for the next five weeks, meaning the colored map was seen on the air night after night. Talking heads started using the "red state" or "blue state" labels as part of the national conversation, reinforcing this sense of our political geography. And it stuck. The keynote speaker at the 2004 Democratic convention objected to the red-state, blue-state paradigm and called it false. His name was Barack Obama, and he would go on to serve two terms as president. But the use of blue-and-red labels survived his keynote — and became all the more common. Back then, Donald Trump was more likely to pop up in People or in the tabloids or on other Access Hollywood videos with Billy Bush — talking about his preparedness to be president or trying to find his polling place with no success — than on a serious political program. When Trump returned to politics with a vengeance in 2015, he did so as a Republican and embraced the color red with gusto. The "Make America Great Again" hats that symbolized his campaign came in various colors, but Trump seemed fond of the red one, which came to the heads in his rally crowds. Red is a primary color, striking and radiating in its strength. Its value in these respects is reinforced by the great many sports teams — professional and amateur — that have worn it proudly for years. But it is hard to miss the historical weirdness of a Republican president who so proudly waves the symbolic color of communism, even as he tries to remake America's attitude toward Russia — the country where communism first came to power.